Walgren Lake near Hay Springs has long been the purported home of an elusive "sea monster." The Sand Hills, which occupy much of central and western Nebraska, are the largest sand sea in the Western Hemisphere. 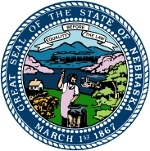 The state of Nebraska is located in the Great Plains region of the Midwestern United States. The capital of the state is the city of Lincoln, however the largest city is Omaha which is located right on the Missouri River. Many historical trails cross the state, however it was the California Gold Rush that initially brought a large amount of people here, and Nebraska eventually became a state in 1867. Nebraska has large temperature variations between its summers and winters along with violent thunderstorms and tornadoes are frequent in the area. Two different climate zones are prevalent in the state with the eastern half of the state experiencing a humid continental climate and the western half experiencing a semi-arid climate. Much of the state consists of treeless prairie land which is used for cattle grazing and is also a major source of beef and pork production along with corn and soybeans. The state is largely rural is the 8th ranked least densely populated state in the country with only 1.84 million people residing in the state. 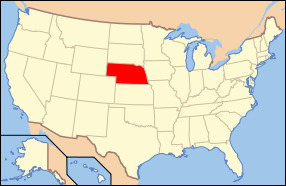 Nebraska consists of 77,358 square miles of land area. Nebraska consists of the largest group of German-Americans as well as the largest population of Czech-Americans per head. The major industries in the state are primarily farming (wheat, soybeans, corn, sorghum), meat packing, grain processing, and the Air Force Strategic Air Command. Nebraska's major bodies of water are the Missouri River, Platte River, Republican River, Niobrara River, Lewis and Clark Lake, Lake C.W. McConaughty, and Harlan County Lake. The highest point of elevation in the state is Panorama point which sits 5,426 feet above sea level. The state bird is the Western Meadowlark, the state fish is the Channel Catfish, the state flower is the Goldenrod, the state tree is the Cottonwood Tree and the state grass is Little Bluestem. Nebraska is one of the nations top agricultural points in the country and will continue to be due to the farming type landscape that covers most of the state. Boot Hill, or Boothill, is the name for any number of cemeteries, chiefly in the American West. During the 19th century it was a common name for the burial grounds of gunfighters, or those who "died with their boots on".